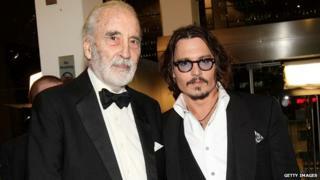 Johnny Depp has paid tribute to Sir Christopher Lee, saying he was "as noble and gallant as he was wise". The veteran actor died on Sunday 7 June in London aged 93, after being admitted to hospital for respiratory problems and heart failure. Depp starred in five films with Sir Christopher, including Charlie and the Chocolate Factory and Dark Shadows. He described him as "a wonderful man" who was "profoundly kind, generous [and] warm". "The consummate gentleman. He was an inspiration in both life and art. In the time we spent together, I had the honour and good fortune of being welcomed into his illustrious proximity," Depp said. "His friendship is one that I will always hold close and dear to my heart. "He was the last of his kind. A rare specimen. A brilliant mind with a beautiful heart whose strength of spirit will, in turn, live on in the hearts and minds of many, many generations to come." The pair first shared a screen in 1999's Sleepy Hollow, in which Sir Christopher played the Burgomaster. The actor also voiced characters in Corpse Bride and Alice in Wonderland. All of the films were directed by Tim Burton. Burton paid his own tribute last week, saying Sir Christopher had been "an enormous inspiration to me my entire life". Sir Christopher appeared in more than 250 movies, making his name playing Dracula in the Hammer horror films. More recently he gained new fans thanks to roles such as wizard Saruman in The Lord of the Rings and The Hobbit movies, and the lightsaber-wielding Count Dooku in Star Wars Episodes II and III.